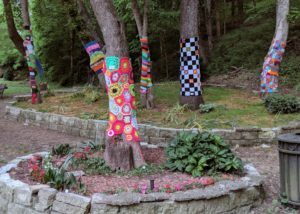 I never even knew what a yarn bomb was until I moved here to Eureka Springs. One of the first things Debbie and I saw were the trees at Music Park on Main street covered with knitting and crotchet all over the little park. Then, for some reason, some cruel group of thugs (I actually have no idea who did it), cut the pieces of art off the trees and took them away. What a shame, we thought. Little story in the local paper about it, but the crime is still in the cold case files of ESPD. 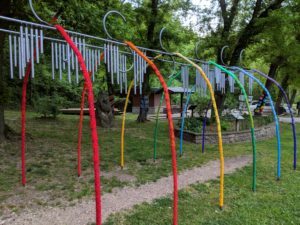 For a little history: Apparently, the practice is believed to have originated in the U.S. with Texas knitters trying to find a creative way to use their leftover and unfinished knitting projects, but it has since spread worldwide. Houston artist Bill Davenport was creating and exhibiting crochet-covered objects in Houston in the 1990s, and the Houston Press stated that “Bill Davenport could be called the grand old man of Houston crocheted sculpture.” Artist Shanon Schollian was knitting stump cozies in 2002 for clear cuts in Oregon. 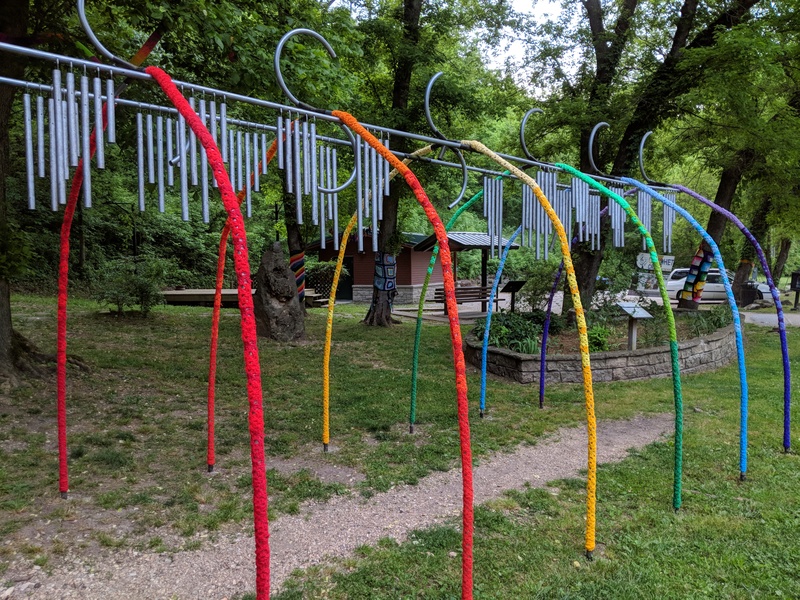 The Knit Knot Tree by the Jafagirls in Yellow Springs, Ohio gained international attention in 2008. The movement moved on from simple ‘cozies’ with the innovation of the ‘stitched story’. 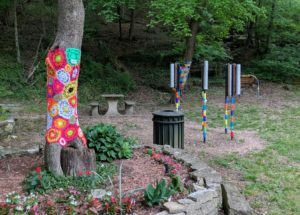 The concept has been attributed to Lauren O’Farrell (who creates her street art under the graffiti knitting name Deadly Knitshade), from London, UK, who founded the city’s first graffiti knitting collective Knit the City. The ‘stitched story concept’ uses handmade amigurumi creatures, characters and items to tell a narrative or show a theme. 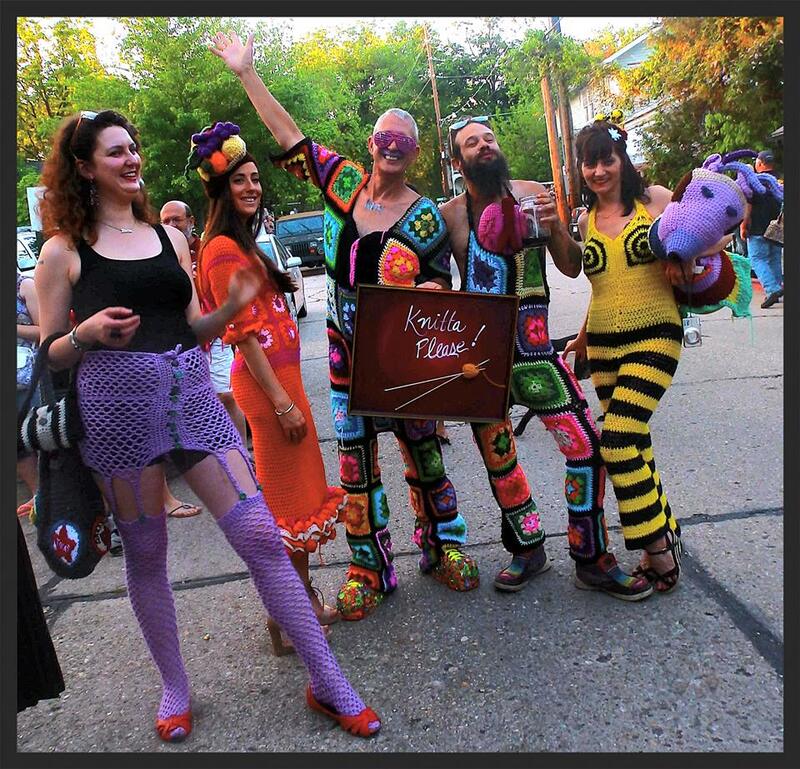 This was first recorded with the Knit the City collective’s “Web of Woe” installation in August 2009. The Knit the City collective were also the first to use O’Farrell’s term ‘yarnstorming’ to describe their graffiti knitting, as an alternative to the more popular term ‘yarnbombing’. 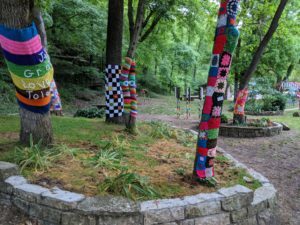 Yarn bombing’s popularity has spread throughout the world. In Oklahoma City the Collected Thread store yarn bombed the Plaza District of the city on 9 September 2011 to celebrate their three-year anniversary as a functioning shop , and in Australia a group called the Twilight Taggers refer to themselves as ‘fibre artists’. 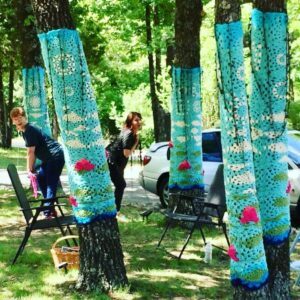 Joann Matvichuk of Lethbridge, Alberta founded International Yarnbombing Day, which was first observed on 11 June 2011.